This had to be the most heated debate and an utterly useless one. The topic had a foregone conclusion but some self-appointed authority on automobiles and driving had started it. How to grip the steering wheel was the topic. The self-appointed authority said that he had read ‘somewhere’ that the proper way to grip the steering wheel was to have the hands positioned in the 8 o’ clock-4 o’ clock position! I simply could not believe it. So I tried it. Impossible! I had to grip the steering wheel from behind! Totally bizarre! Defies logic and common sense! 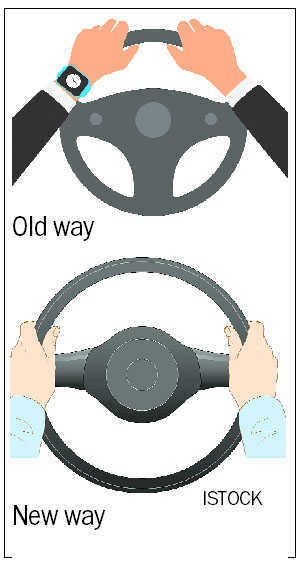 The correct way, the only way, is to have your hands in the 10 o’ clock-2 o’ clock position — ideal for highway driving, city driving or hill driving. That’s what I was taught for the last for the last six decades. However, things have changed. Some of the most recent cars have redesigned the cross T-bar of the steering wheel. The horn button, audio controls, blue tooth, cruise control buttons are all on the T-bar. These are operated by the thumb. So the 9 o’ clock-3 o’ clock positioning is necessary. The wiper washer stalk and light flasher all fall easily to the fingers behind the steering wheel. You don’t really have to take your hand off the steering wheel. Complete control over the steering wheel. Complete control over the car. Most important! In the 9 and 3 position, your hands are as far apart as possible. In case the air bag deploys, it comes out at about 200 kmph. If the hands are far apart, the air bag has enough space to come and cushion your body. If it caught your arm, it would push the arm into your face! With the hands in 9-3 position, the arms are perfectly balanced. This gives you complete and easy control over the steering, meaning your car. Why? Two hands are better than one, especially if you have an emergency situation like a skid or tyre burst. Driver comfort is the most important agenda on the manufacturers design list. Seats are ergonomically designed, switches and dials are placed where easy access makes sure no energy or time is wasted in operating them. Wasting energy means building up driver fatigue. The steering wheel should be placed low, make sure your instrument panel is easily visible. Now, with your hands in the 9-3 position, your biceps and shoulder muscles are relaxed. No tension on the body parts! They are ready and poised to leap into action in case of an emergency. Fatigued and tired limbs will not have that speed. Holding your hands higher on the steering wheel will fatigue your arms and make driving safely more difficult and demanding. It is an accepted fact that driver fatigue is a cause of many accidents. Please pay attention to the accompanying images of the hands in the old position, 10 o’ clock-2 o’clock which has been the norm since Day One. The old way! It took the manufacturers this many years to redesign the steering wheel to accommodate the buttons for the new found gizmos. The fact of the matter is they did not exist a decade ago. The new way! What we have to accept is that though driving may be becoming more complicated, it is definitely getting safer.